I do like Gmail, but (1) it feels sluggish, (2) writing anything nontrivial in a browser text box is just too awkward, and (3) I occasionally wish I had a copy of my mail accessible offline. So I've been trying to switch over to retrieving and reading my mail in Emacs. After a failed experiment in using Gnus to read my mail last year, I recently mustered the energy to try VM. It seems to be working well, and I'll write more about my configuration and workflow later, but I wanted to mention one package that I just found. VM doesn't support such functionality out of the box, but the package u-vm-color.el mimics it. The package is fairly straightforward to install and works as advertised. One thing I discovered that when you run a TTY Emacs it assumes that it is working with light text on a dark background. 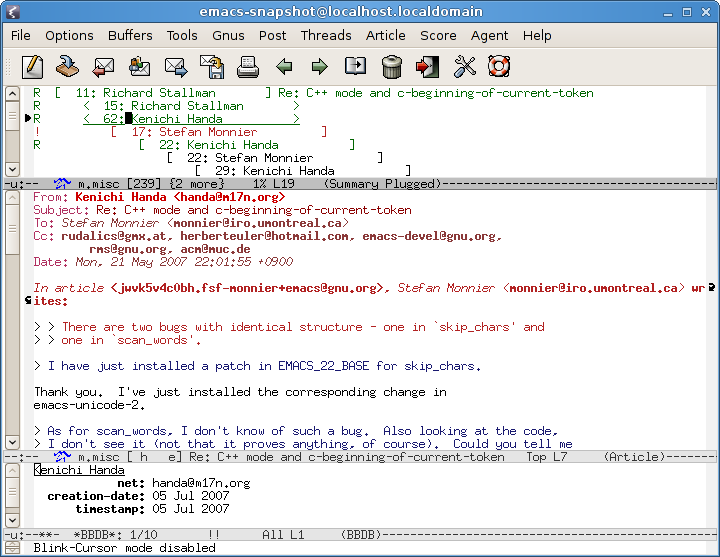 If you are running Emacs in an xterm with dark text on a light background, you'll need to supply the -rv (reverse video) option to Emacs. Otherwise, Emacs may choose unreadable, or at least, suboptimal, colors for all its faces. Looking forward to it! I have found your emacs tips to be tremendously useful, and have been meaning to start reading email within emacs for quite some time.